2. Healthy cows, buffaloes and heifers with good body condition and growth. 3. Cows with normal reproductive tract. 4. Cows and buffaloes not shown heat signs even after 3 months of calving. 5. Cows not conceived after 2 or 3 AI/NS. Ensure that the animal is not pregnant from reproductive history and rectal examination. Exam for pregnancy 2 times with 15-30 days apart for the presence of amniotic vesicles, fluid feeling, dissimilar uterine horns, double slipping, fetal bump, placentomes etc. Action 1: Examine rectally for pregnancy. Deworm with 1.5 to 3g of fenbendazole (as single dose) depending on body weight. Advice the owner to feed well with concentrate and green fooder. Action 2: Examine rectally for pregnancy. 1. Wash the external genitalia with tap water. 2. 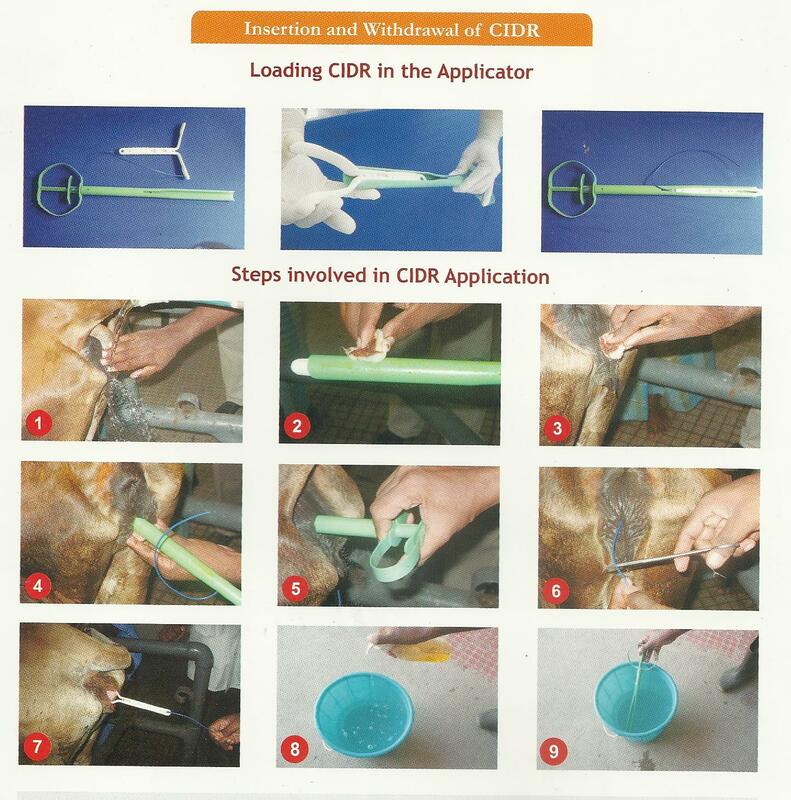 After loading CIDR, apply povidone iodine over applicator. 3. Wipe external genitalia with povidone iodine. 4. Evert the vulval lips and gently insert applicator (the nylon wire on ventral side) with CIDR to the maximum extent possible. 5. Release the CIDR by pushing the piston (While pushing the piston, the applicator will tend to come back and the CIDR might protrude outside. Avoid this by keeping forward pressure on the stem). 6. Cut the excess nylon wire leaving 2-3”. 7. On the day of withdrawal, simply pull the nylon wire. 8 &9 In between applications, wash the applicator in a bucket of water mixed with antiseptic. Prostaglandin is commonly used in both cow and heifer synchronization protocols. Prostaglandins are effective in synchronizing heat only if females are cycling, but they are not effective on all days of the estrous cycle. 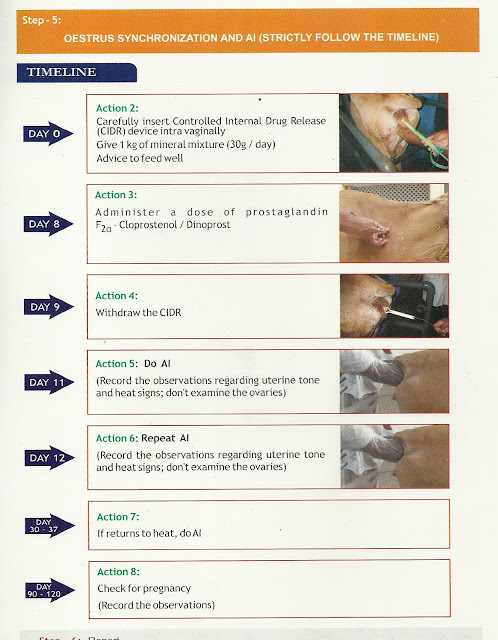 Prostaglandin injected between day 5 and 20 of the estrous cycle regresses the corpus luteum (CL). It can be used as the sole hormone administered to cattle for synchronization purposes. However, timed insemination protocols require additional hormones.